In addition to our bespoke work, Staff Roster Solutions offers two main products for developers and providers of workforce scheduling and roster solutions. These are AutoRoster and ShiftSolver, both of which are designed to provide automation capabilities to workforce management software developed by our clients. AutoRoster automatically assigns individuals to user-defined shift patterns based on the rules and preferences of the employer and employees. The automation models used are sufficiently flexible to account for a wide range of workforce management needs. This is possible since the models can easily be customised according to the needs of the individuals and the workforce management requirements. 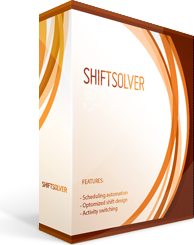 ShiftSolver has many of the same modelling options as AutoRoster but is designed for problems in which the start and end times of shifts also need to be decided for each employee for each day. It will also position breaks and assign activities within shifts according to the user-defined rules and preferences. The demand/cover constraints are specified by activity (and optionally skill) for each user-defined time interval within the planning horizon (such as every 15 minutes for example). A fully documented platform independent XML interface means minimal integration time. Flexible options for passing in data and scheduling requirements enables easy modelling of staff scheduling problems. 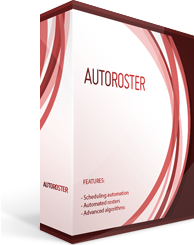 AutoRoster is the only scheduling engine of its kind available on the market today. Extremely fast, advanced problem solving algorithms produce solutions based on your objectives. Developed using the .NET Framework and fully supported running under Windows and Linux (using Mono) environments. The engine is used with both web-based (SaaS) and standalone applications. The XML modelling format allows complete customisation of the parameters, constraints and objectives unique to each employee scheduling problem. Allows extracting and presenting to users information about the current best solution as the solver is running. As well as generating optimal solutions, AutoRoster can also be used as a rule engine to identify and highlight any violations of constraints and objectives defined for each scheduling scenario.